It’s hard to believe that it’s already time to think about the kids going Back to School. 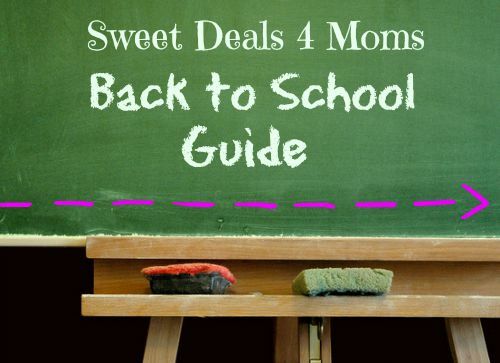 Here are some of my favorite items and stores that will help your child get prepared for the big day and help you ease back into that super busy school year schedule. Disclosure: I received free product samples in exchange for posting products to this page, however all opinions stated are my own and I do believe these items are perfect for Back to School time! Backpacks are the ultimate back-to-school necessity. Marshalls is ideal for the back-to-school season, as you never know what surprises (at great prices) you may find when you walk in the store, for anyone in the family. They not only have a large selection of backpacks, but also clothes as well as dorm decor. Find a store near you. Mom’s Best offers fun, great-tasting cereals with honest to goodness ingredients. These cereals are a delicious way to get your kids’ day going in the right direction. Their prices reflect the cost of the ingredients to make their products, and they pass that savings on to families. Favorites include Sweetened Wheatfuls and Crispy Cocoa Rice. Buy it. The JOY Deluxe Insulated Lunch Cooler Tote Bag transports your food and beverages in style, while keeping them hot or cold. This fashionable insulated tote is cleverly designed – from the water-repellant exterior, to the handy hook-and-loop handle closure and exterior storage pocket, to the easy to wipe clean insulated interior, there’s so much to love! Buy it. Barbara’s Bakery was founded in 1971 by a 17 year-old girl with a passion for creating great-tasting food from simple, wholesome ingredients. Products are all non-GMO, offer whole grains, lower sugar, no artificial flavors, and free from sweeteners or preservatives. With no refined sugar or hydrogenated oils and special dietary options (including gluten free), it’s no wonder these products are a dietician favorite. Buy it. Charging our phones has become the ultimate essential necessity. FosPower’s PowerActive Power Bank is an essential students and all people who carry a mobile phone! You’ll never run out of battery juice again. Unlike other power banks, FosPower’s PowerActive not only charges USB-powered technological devices but it is built to withstand tough environments: from the snow to extreme water resistance. This power bank is built tough to last and offer 10200 mAH power. Buy it. Boulder’s Quinn Snacks, a 7-year-old natural foods company known for reimagining classic snacks like microwave popcorn and pretzels, is pleased to announce the expanded distribution of Quinn Pretzels to all Whole Foods Markets nationally June 27. The first and only whole grain, ancient grain, Non-GMO project verified, certified gluten-free naturally gluten-free pretzels currently come in Classic Sea Salt Pretzel Sticks and Twists, Touch of Honey PretzelSticks, and the newest addition to the pretzel family, Deli Rye Style Rods. Buy it. Bubi Bottle is the water bottle combined with both durability and fashion. The 14 oz is the hydration essential for quick errand runs, parents on-the-go or study sessions at school. This collapsible water bottle also rolls up to fit into your purse or backpack. It is made with BPA-Free silicone and puncture-resistant (alligator approved)! Bubi is easy to clean: you can also flip it inside out to get all the junk out or throw it in the dishwasher (on the bottom rack too!) It is ready for your average day or biggest adventure yet. Most of all, this BPA-free reusable water bottle is the last water bottle that you will ever need! Buy it. SoapStandle allows bar soap to ‘shed’ water and dry, so “goo” never develops, by attaching to the bar soap to create a platform for water to drain. Avoiding the goo is important beyond that it’s messy. When goo develops soap deteriorates faster, and instead of cleaning it goes down the drain. It’s simple to use. Just press your soap bar down firmly onto SoapStandle’s rounded points. Your soap will last longer (saving you money) and it won’t slip from your hand. When you’re ready, move your SoapStandle to a new bar. Buy it. For on-the-go moms racing against the clock during the morning rush, finding a healthy snack the little ones will want to eat can be a real challenge. Fortunately, Tree Top’s all-clear apple sauce pouches are here to catapult every kid’s lunch game to the top of the class. They are delicious, healthy, portable and best of all – parents can see the goodness that will go in their children’s bodies! It is literally the whole (clear) package. Tree Top’s new line-up of transparent pouches includes seven healthy, on-the-go fruit options. Along with being delicious, Tree Top’s pouches are also healthy: they are made with 100% American apples, and have no high fructose corn syrup or artificial flavors and colors. Buy it. Perfect for easy after school snacks, office lunches for mom and dad or dinners for all! Delicious Asian-inspired Blount Bowls from legacy food developer Blount Fine Foods. They have a couple gluten free flavors and one vegan/vegetarian and all chicken is raised without antibiotics. They’ve done the meal prep for you and it’s ready to eat in 3 minutes, all compact in the bowl that is provided. Available in the fresh deli section of select retailers across the country, and under $6. Buy it. Since the Rocketbook Everlast and Everlast Mini are endlessly reusable, the need to purchase multiple notebooks is eliminated, saving you money this back to school season. Kids and teachers love Rocketbook because it’s easy and cool to use. Simply wipe the pages clean with a damp cloth to reuse over and over again! Rocketbook also has the ability to scan your notes and send them to your favorite cloud services via the Rocketbook app. This way, it’s easier to share your notes with friends, teachers and fellow students! Buy it. Welch’s Fruit Snacks just dropped the fruit snacks of your dreams: Superfruit Mix! These feature a delicious and unique combination of trending flavors and fruit shapes including: Pomegranate-Passionfruit, Starfruit-Kiwi, Dragonfruit-Blackberry, Açai-Blueberry, Goji–Apricot. Like all Welch’s Fruit Snacks, Superfruit Mix is made with fruit as the 1st ingredient and are gluten-free. Buy it. Elmer’s Glow in the Dark Liquid Glue is specially formulated washable glue that comes in luminous neon colors ideal for any arts and crafts! Whether used for decorating, painting, gluing, and even for making slime, this easy to use glue allows for endless creativity. Available in blue, pink or natural. Buy it. Learning to write is an important stage in every child’s development, but writing products today are not designed with kids in mind. The Paper Mate Handwriting triangular woodcase pencil provides control for early writers! Buy it. School Uniform ClassMate Large Backpack from Lands’ End is built to last a lifetime. This backpack’s kid-friendly features go beyond carrying capacity. For one thing, it’s made from durable, polyester with a water-repellent finish. The padded, adjustable shoulder straps are securely stitched, so this cute backpack can take all the dropping, dragging and tugging their school day has in store. Buy it. BAND-AID Brand Adhesive Bandages offers plenty of first-aid essentials for back to school. BAND-AID Brand HYDRO SEAL Adhesive Bandages for wound care and foot care are 100% waterproof and keep dirt, germs and bacteria out, so your body’s natural healing power can go to work. Additionally, BAND-AID Brand Decorative Adhesive Bandages are a fun way to heal those back to school boo-boos, with decorative bandage designs like Incredibles 2 and more. Buy it. ARM & HAMMER Spinbrush battery-powered toothbrushes with fun designs like Shimmer & Shine, Mario, Avengers, and Jurassic World (which is newly available,) help promote healthy brushing and good hygiene habits early on and feature characters’ kids love, have smaller, soft-bristle power heads to fit smaller mouths. They also massage gums, fight cavities and promote a lifetime of happy, healthy brushing! Buy it. Comfortable, roomy, and sturdy, Fenrici Backpacks offer children an ideal backpack for carrying all of their necessities with ease…. all while knowing that they have made a difference in another child’s life as 5% of net proceeds are donated to non-profit Global Genes to fund the research and education for childhood rare diseases. Buy it.